It is hard to know where to start with this one. I remember having a similar problem discussing Cloud Atlas but that was because it was so bad on so many levels and not as epic and involving as it thought it was. That isn’t the case with a TV show that has been running for fifty years and has all of time and space to weave its stories round. It is too epic and involving and it is tricky to say enough to do it justice. Still, I am prompted to say something because Doctor Who is coming to UK cinemas. They are not making a Doctor Who film, not technically, but on 23rd November, the anniversary of the day it was first broadcast, the big birthday episode will be playing on big screens at the same time that it airs on the small. That has to effect those precious viewing figures, right? Who is going to want to watch it at home? I have seen Doctor Who on a cinema screen before and am thrilled to have the opportunity to do so again. We are so familiar with Doctor Who now that it is easy to forget how great the ideas behind the show are. A centuries old alien from a race of beings who have mastered the ability to travel through time and space? That is brilliant! His space craft/time machine is bigger on the inside with the ability to change its appearance to look like anything but has got stuck looking like an old fashioned British police phone box? That is also brilliant, a little quirky and random but that just makes it all the more brilliant. We have got equally used to daleks, companions and regenerations too but all of this is what makes Doctor Who a show full of amazing design and superb story telling. Of course it was once also a show with a reputation for low production values and monsters that looked a lot like men in suits. I’m not sure quite what people expected of it but maybe it was this along with that sense of familiarity that meant many people stopped watching, allowing Doctor Who to fold in 1989. There were undoubtably those who thought we’d seen The Doctor’s last on screen adventure (especially after the failed revamp in 1996) but let’s be honest, it was only a matter of time until the time lord came back. So it was that eight years ago we saw him step out of the Tardis once more, this time with a northern accent, a leather jacket, a gay agenda (no problem with that) and a penchant for running. There was probably some nervousness from fans and the BBC alike that the show would not measure up (especially after the failed revamp in 1996) but it was glorious. Everyone tends to think of David Tennant as the Doctor that rode the show’s new wave of popularity and indeed there is already plenty of webspace dedicated to that but that first season is probably the most consistent in terms of quality. There have been highs (don’t blink) and lows (the daleks take Manhattan) since 2005 but those first thirteen episodes with Christopher Eccleston, great in the title role, contain many wonderful things. We had the massively creepy boy with a gas mask face, the woman who had so much cosmetic surgery she is just a sheet of skin, Charles Dickens, the lone dalek, Cardiff as a place of cosmic significance, a reunion with a dead father, Raxacalicofalipatorious and Rose (Billie Piper of all people) who was magnificent. We also got the realisation that all of the other time lords had died in some cataclysmic time war and that it was our hero that pressed the big button, destroying his home planet Gallifray. That is a bold idea and one that looks set to have new significance in the upcoming episode(s). Doctor Who has had a number of story threads that have played out across a series or so. Sometimes this has worked well as with ‘The Doctor Donna’, ‘the crack in Amy’s wall’, ‘Rose returning from another reality’ or ‘Madame Kovarian’ but at other times it has petered out to nothing or had a disappointing resolution as with ‘who blew up the Tardis?’ or ‘the impossible astronaut will kill The Doctor’. We can’t be sure at this stage but it looks like the end of Matt Smith’s time in the blue box will explore the man who ended the time war. This is who it seems likely we met at the end of the last series when John Hurt appeared on screen and was introduced as The Doctor. He is clearly a generation of the man we have not previously known about and, while time can be rewritten, he probably comes chronologically between the two Doctors for whom we never saw a transitional regeneration; Paul McGann and Ecclestone. This is a nice way to make something of the fact that the 1996 American TV movie, featuring McGann, never led to a series as intended meaning we never saw his story played out. This new Doctor is apparently not like the others, he has done something uncondonable and his existence has consequently been redacted. This all fits with the idea that he is the genocidal time war Doctor and it makes sense in light of several things we have seen already. Is this the first suggestion of an unknown incarnation? It has been made clear on several occasions in the reigns of Ecclestone, Tennant and Smith that The Doctor feels immense guilt and hates himself because of what he did. Of course this doesn’t mean the same thing to someone who has actually been a number of different people. What he actually hates is an alternate version of himself rather than his actual self. In his final episode Christopher Ecclestone’s Doc was not prepared to destroy earth, ending billions of lives, to prevent the Daleks taking over the universe, yet this is exactly what he is reported to have done at the end of the time war, triggering some device that wiped out all Daleks and Gallifreyans alike. This inconsistency is easily explained if it had been not Dr. Ecclestone but a different, previously unknown, incarnation that had done the deed before. He is also seen checking out his reflection in the very first episode suggesting that this face is a new one and he has only recently regenerated. Interestingly we see a very similar thing in David Tennant’s last episode. Once again we see that this destruction of civilisations is simply not something The Doctor is capable of. The Time Lords have come back and have a plan to wipe out all of time and creation allowing themselves to transcend and become creatures of consciousness. “You see now?” says Dr. David, “That’s what they were planning in the final days of the war. I had to stop them.” That seems reasonable. If they were going to annihilate everything that is, everything that ever was and everything that will be then I can see that they needed to be put down. The Doctor has a pistol and all he has to do to stop this happening again is pop a cap in the time lord president. But he can’t do it this time. All he has to do is kill one man, not billions, but he isn’t even up to that. The Doctor who could and did was clearly a very different type of man. No wonder he’s been disregarded. Matt Smith’s Doctor does not have an equivalent moment but there is something else that happens adding to this idea of a bad version of himself. While travelling with companions Amy and Rory, he finds himself in a hotel with a room for everyone that contains their worst fear. The Doctor takes a peek behind his door and on seeing what is on the other side calmly says “Of course, who else?” I think we know who was in that room now. Here’s Johnny! What could possibly be more frightening than the worst, most abhorrent version of yourself, a version that killed an inconceivable amount of people and could resurface to do it again? Mind you, as the sole survivor of said war, The Doctor is the only one who could possibly have written the book so maybe it paints a prettier but less honest picture. One of the things you need to know about The Doctor is The Doctor lies. Certainly the man’s dark side has been explored before. Notably with The Valeyard back in Colin Baker’s day who having spent an entires series trying to get The Doctor executed for crimes he hadn’t committed was revealed to be a nasty future version of our favourite time lord, described as coming somewhere between the twelfth and thirteenth regeneration. I’ve never quite understood this last bit, it seems to suggest some sort of sub-regeneration but actually this could set a handy precedent for explaining the existence of John Hurt in a timeline that had Paul McGann as Doctor no. 8 and Ecclestone as no. 9. In ‘new Who’ we have had The Dream Lord as well. This character, played by Toby Jones, was a sentient and malevolent manifestation of The Doctor’s self pitying, gloomy bits. The story that ended with the John Hurt cliffhanger was all big set up with appearances by previous Doctors, preparing us for the anniversary special. Unlike original revamp writer Russell T. Davies though, current show runner Stephen Moffat doesn’t always feel the need to go epic with his follow up episodes. The end of Matt Smith’s first run came after a huge forty five minutes that brought all of The Doctor’s previous enemies together but that final episode ultimately just concentrated on The Doctor and his compadres with a single rusty dalek, a mop and a fez thrown in for good measure. In some respects I would like the fiftieth birthday episode to go the same way but perhaps that is not what cinema screens call for. Either way I expect the unpredictable, unconventional time war Doctor to be involved. I could quite clearly be completely wrong with all of this but I’m okay with that. Theorising about stuff like this is part of the fun with a show like Doctor Who. We’ll (probably) find out in November. Maybe this unnumbered Doctor with no set place in the chronology is not new, maybe it’s just the Peter Cushing one again. 1. Why do none of the behind the scenes photos or publicity shots feature Billie Piper? 2. How will the Matt Smith Doctor interact with Rose? Will the Matt Smith Doctor interact with Rose? 3. Now that Peter Capaldi has been cast could this be the first anniversary special to feature a future Doctor? 4. Will there be a flashback with Timothy Dalton hamming it up again as Rasilon opposite the effortlessly brilliant acting of a true master like John Hurt? 5. 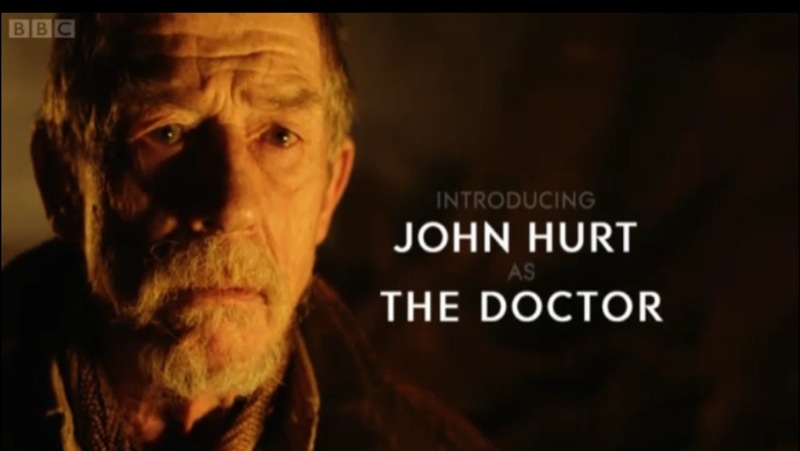 Will there be any other cause for me to put the words ‘John Hurt’ and ‘master’ together in a sentence? 6. Why is Ingrid Oliver’s character wearing the fourth Doctor’s scarf? 7. Was all that stuff in the press about Christopher Ecclestone refusing to appear an elaborate smokescreen? 8. Will Joanna Page’s appearance as Elizabeth I extend past the pre-credit sequence? 9. What surprises do they have in store? 10. Can this episode possibly live up to expectations? Tagged 50th anniversary special, Christopher Ecclestone, David Tennant, Doctor who, doctor who to play in cinemas, introducing John hurt as the doctor, John hurt's doctor, Matt smith, Stephen Moffat, the time warBookmark the permalink. Mark, always enjoy your blog and glad you had a wee look at Dr Who. The girl in the fireplace has to be my fave of the recent episodes with Blink a close second, the weeping angels have got to be the best baddie thought up in Sci fi in a long long while and so simple, keeping to the Who aesthetic. Graham. Thank you Graham, I know you read my blog because the stats on the site let my know how many views I get in each country and while I occasionally get someone who finds me on line from somewhere abroad, Cyprus pops up with some regularity. I am so pleased you like it and thank you for responding to this one. The Stephen Moffat written episodes from the first few series were all great, Girl in the Fireplace, Blink, Silence in the Library, The Empty Child. His episodes haven’t been as consistently good since he took over the show and I thought Neil Gaiman might have taken his place as best guest writer but his Cyberman one from this year was not so good. God! I’m sounding really geeky now.